백조류는 9종이 알려져 있으나, 우리나라에는 고니, 큰고니, 혹고니 3종이 있다. 가을이 되면 추위를 피해 우리나라의 동해안과 남해안에서 겨울을 난 후 북쪽 캄차카 반도에서 동북부 시베리아에 걸친 툰트라 지대의 먹이가 풍부한 환경에서 번식한다. 고니는 몸길이 120㎝ 정도로 큰고니보다 몸집이 작다. 암수 모두 몸은 흰색이고 부리와 다리는 검은색이며 부리의 머리부분은 노란색이다. 어린새는 몸이 밝은 회갈색을 띠고 부리는 분홍색으로 큰고니 무리 속에 섞여서 겨울을 난다. 큰고니는 몸길이 152㎝ 정도로 암수 동일하며 몸은 흰색이고 어린새는 검은빛을 띤 회색이다. 부리 끝이 구부러져 있어 고니와 구별이 가능하다. 헤엄칠 때는 혹고니와 달리 목을 세운다. 호수와 늪, 하천, 해안 등에서 큰 무리를 이루어 생활하며 암수와 새끼들의 가족군으로 구성된다. 물에서 나는 식물의 줄기나 뿌리, 육지 식물의 열매, 물 속에 사는 작은 곤충 등을 먹는다. 혹고니는 몸길이 152㎝ 정도로 암수 동일하며 몸은 거의 흰색이고, 어린새는 회갈색에 부리는 검은색이다. 선명한 오렌지색 부리에 검은색인 혹과 부리의 머리부분 때문에 다른 고니들과 쉽게 구별된다. 목을 굽히고 부리가 아래로 향한 모습으로 헤엄친다. 저수지나 호수 등에서 생활하며, 주로 물에서 나는 식물을 먹지만 작은 동물도 먹는다. 고니류 가운데 수가 가장 적고, 동북아지역에서는 유일하게 우리나라에서 겨울을 난다. 백조(고니, 큰고니, 혹고니)는 국제적 보호가 필요한 진귀한 겨울새이므로 천연기념물로 지정하여 보호하고 있다. 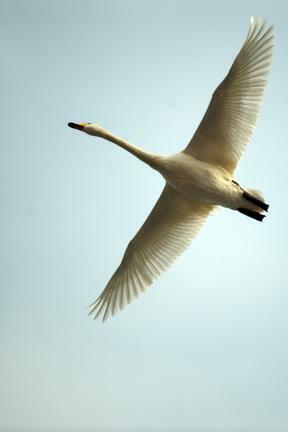 Of the nine species of the swan (Cygnus) family, three are found in Korea, including tundra swan (Cygnus columbianus), whooper swan (Cygnus cygnus) and mute swan (Cygnus olor). 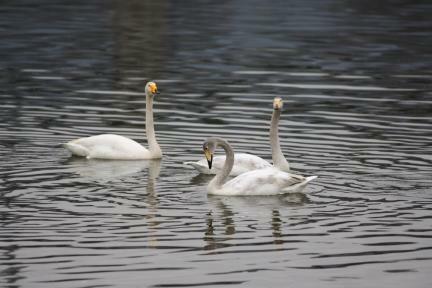 These swans arrive in the fall, on the east and south coasts of the Korean peninsula for wintering. In spring, they fly north to the tundra zone extending from the Kamchatka Peninsula to northeastern Siberia where food is abundantly available to breed there. 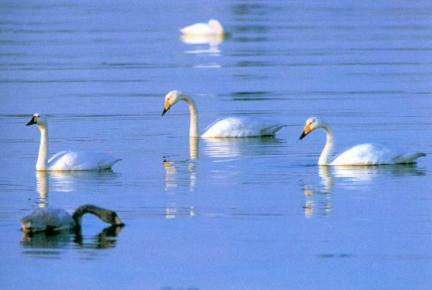 The tundra swan, about 120cm in length, is smaller in size than the whooper swan. Both the cob (male) and pen (female) have a white plumage with a yellow-tipped black bill and black legs. Swanlings, meanwhile, have a light grayish-brown plumage and a pink bill. 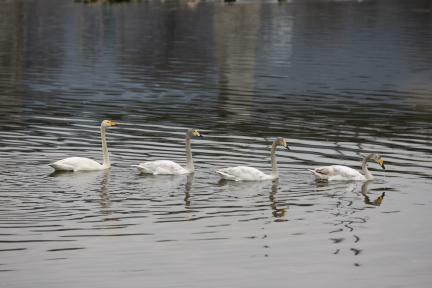 The young winter together with adult whooper swans, mixed into the flock. 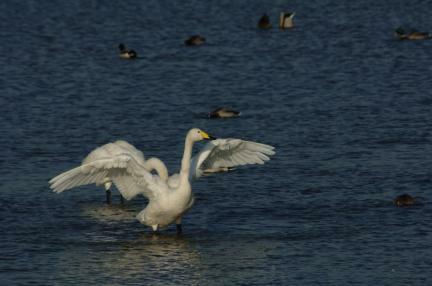 Whooper swans are 152cm long, both the cob and the pen. The plumage is white in color, while the swanling is dark gray. The bill is slightly bent downward at the tip, which distinguishes the whooper swan from the tundra swan. The whooper swan holds its neck upright while swimming, another characteristic that distinguishes it from the tundra swan. They main habitats are lakes, marshlands, rivers and coastal areas. They live in large colonies whose basic units are families consisting of a cob and pen and cygnets. Whooper swans feed on stems and roots of aquatic plants, grasses, seeds as well as aquatic insects. The mute swan is about 152㎝ long, both the cob and pen. The plumage is almost completely white, while the young have a grayish brown plumage with a black bill. The vivid orange-colored bill with a prominent, black knob above makes it easy to distinguish the mute swan from other members of the swan family. The mute swan holds its neck bent and the bill pointed downward while swimming. Water reservoirs and lakes are their favorite habitats. Feeding mainly on waterweeds, mute swans also eat insects and other small animals. The mute swan has the smallest distribution of any swan species. The only wintering sites of this waterfowl species in Northeast Asia are found in Korea. 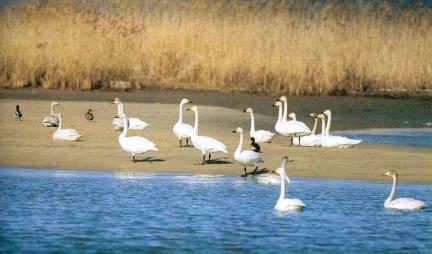 Swans (tundra, whooper and mute swans), a rare winter fowl that requires international conservation efforts, are currently protected in Korea under designation as a Natural Monument.